Hand painted large salad bowls in Vegetable Salad Design which are great for serving large salads to your guests. Clearly Susan's hand painted salad bowls come with radishes, carrots, and purple onions with caterpillars and lady bugs playing hide and seek. A delightful gift for that special cook. Check out the vegetable garden tongs that go with this set. 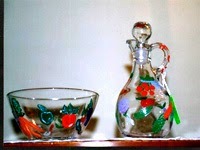 Look at other dinnerware and serving pieces that we can hand paint in this design or any other design that you like.